If you want to get a little spice of Daredevil to go with the treats, I recommend rereading Daredevil #7 (2011), by Mark Waid and Paolo Rivera, which sees Matt Murdock fight the elements after he and a group of blind children find themselves stranded after a bus crash, just before Christmas. That issue gets off to a nice enough start, however, with scenes from the Nelson & Murdock Christmas party. 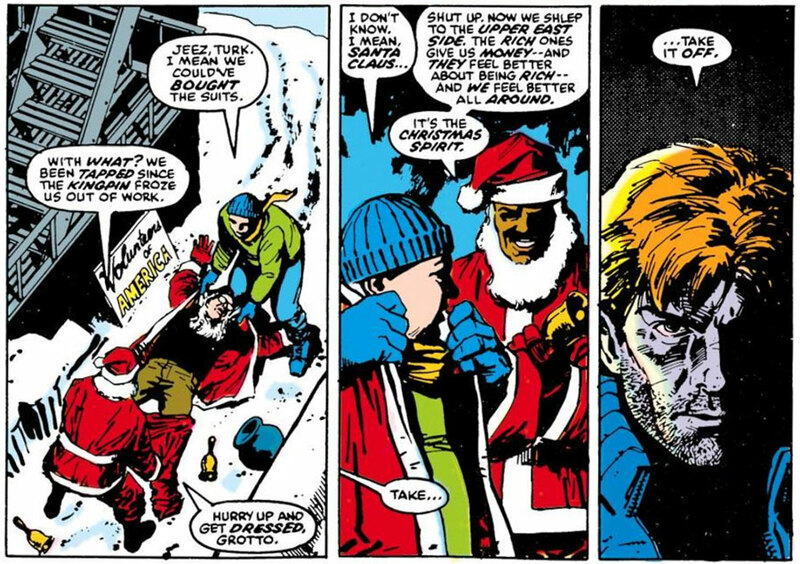 That’s more than can be said for the disastrous Christmas party Matt hosted at his house in Daredevil #206, which I wrote about a few years ago. 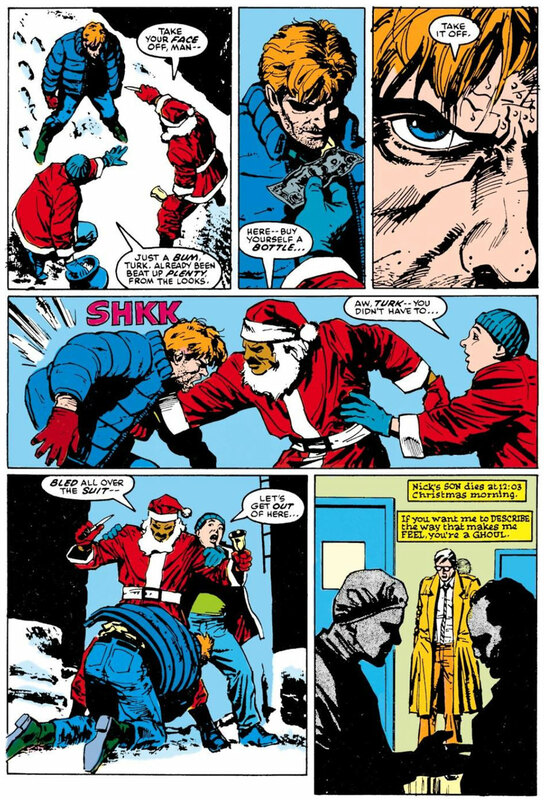 Speaking of bad Christmases, Matt had another one of those in Daredevil #229, by Frank Miller and David Mazzucchelli. The third installment of the landmark story arc Born Again sees Matt beaten up by regular lowlifes Turk and Grotto when he catches them stealing a Santa Claus costume from an unconscious man. This was after he dragged himself out of the river and almost lost his mind. See the key panels below! Okay, so this post may not have succeeded in spreading holiday cheer, but if your Christmas wasn’t everything you’d hoped, I hope you will at least find some solace in knowing that there are probably worse ways to spend it! Yes, it’s time for one of those radar posts again, and we will finally be moving into post-Miller territory, and covering the Daredevil of Denny O’Neil. A thing I’ve thought of quite frequently is the fact that the depiction of Christmas in comics are a good way to keep track of how much “comic time” has passed. Maybe because I missed some Nocenti issues up to the one which guest-starred Wolverine, I thought the Christmas time in Born Again and the Christmas time at the beginning of Nocenti’s tenure were too close (like “it’s always Christmas time in Daredevil). It would be a good idea for a post, how time can be tracked by counting Christmas. As a quick question, how many Christmas times do you remember? (Another awesome thing would be to point the fact that Daredevil has been active during the Vietnam war (remember the visit during Stan Lee’s run?) AND after September 11, 2001 (“Osama bin Laden is a woman” written on the newspaper which outed Matt Murdock)). Hope everyone had a good holiday!